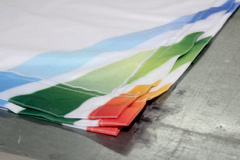 Printing is the most important stage in the production of a sign, but it is seldom the last one. Depending on how the sign will be used, it will have to undergo some type of post processes, such as welding, hemming etc. However, regardless of the required post process, all signs first need to pass through the cutting station, to be trimmed and cut to their final size. How great could it be if prints could come off of the printer already trimmed and cut? What if you could entirely skip the cutting station for straight edges and save all the associated steps and expenses, including expensive equipment, floor space, staff, special software drivers, and most importantly – time and possibility for fatal human or other mistakes in the worst moment? 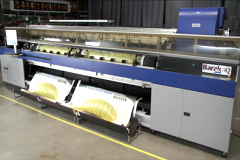 Most print houses have a dedicated cutting station, with expensive cutting equipment which not only cost tens of thousands of dollars, also take up a lot of floor space and engage several staff members. In addition this offline process is open for errors which can be very close to the job deadline. Mind you, cutting a 5m (16 ft) wide PVC banner is quite complex and takes a lot of time and space . It doesn’t matter how fast your printer is, the cutting station often becomes a bottle neck, since it cannot keep up with the speed of printing. EFI™ Matan now offers a unique patented Inline-Finishing system for the EFI Matan 8Q that completely automates trimming and cutting, simultaneously with printing. This new workflow saves time and money, reduces errors and increases yield. No matter which printing mode you are using, the cutting will be 100% synchronized with the printing. This new Inline-finishing workflow of the EFI Matan 8Q includes a set of lengthwise slitters that can be placed along the printer, easily adjustable according to the job position. The slitters trim off the excess margins on-the-fly, at the same time that the file is being printed. Next, the Roll-to-Sheet Cutter cuts the image off from the roll immediately when the printing job is completed. The cutting parameters are set via the printer’s front end software, so cutting is 100% accurate, eliminating wastage from cutting errors. The jobs that come off of the printer are completely ready for the next stage. Watch the video to see how it works? EFI Matan offers lots of more innovations that understand your business.